Sen. Cynthia A. Villar today sponsored the committee report on the bill that will allow local industries to compete in the expanding Halal industry, especially with the onset of the regional economic integration under the ASEAN Economic Community this year. Senate Bill No. 2831 under Committee Report No. 175 seeks to institute the Philippine Halal Export Development and Promotion Program referring to a comprehensive set of objectives, targets, strategies and activities for the growth of Halal industries producing or providing products, processes and services and resulting to increased exports of Halal products. “The regional economic integration will signal the expansion of Halal trade all over ASEAN countries. We must be ready to be at the forefront of that,” Villar said. “Without a halal export legal framework in place, our products become susceptible to doubts from receiving countries. Some “fly-by-night” certifying bodies may issue certification without duly inspecting the goods,” she added. Halal means permitted or lawful. Halal foods are those allowed to be eaten according to the Islamic Sharia law. The chair of the Senate Committee on Agriculture and Food also said the government must act proactively to ensure that products from the Philippines are at par with international Halal Standards to earn the confidence and goodwill of trade partners. Villar said there are about 50 halal certifying bodies in the Philippines and prevailing issues on some technical aspects of ascertaining the ‘halalness’ of the products. “Halal food producers in the Philippines are well-positioned to get a chunk of the global Halal market, which, according to a report commissioned by the Dubai Chamber of Commerce, is projected to be worth $1.6 trillion by 2018 and forecast to make up 17.4% of the world food market,” she said. Villar noted that the halal food market will continue to grow with the expanding Muslim population and acceptance of Halal as the food of choice even for non-Muslims. “The impact of government support for Halal industry will significantly benefit the agricultural and manufacturing sectors in Mindanao, including conflict areas. The growth opportunities may even entice the warring factions in those areas, particularly the armed groups, to lay down their arms and join the Halal production base. With ASEAN integration, we can anticipate the inflow of investments and surge in job opportunities in Mindanao,” Villar said. Under the bill, the Philippine Halal Export Development and Promotion Program will be formulated to cover the entire value chain for food, products and services- from production of raw foods and materials, agricultural production, processing, manufacturing, Halal industry promotion and development, export and marketing assistance, business enterprise development, development and application of Halal certification standards, and forging of international agreements to harmonize domestic standards with international standards. To oversee the formulation and the monitoring of the Program, the Philippine Halal Export Development and Promotion Board (Halal Board) will be established. It will be composed of the Secretary of the Department of Trade and Industry (DTI) as chair; Secretary of the National Commission on Muslim Filipinos (NCMF) as vice-chair; and heads of the Department of Agriculture (DA), Department of Health (DOH), Department of Science and Technology (DOST), Department of Foreign Affairs (DFA), Department of Tourism (DOT), Bangko Sentral ng Pilipinas, and Mindanao Development Authority (MinDA) as member government agencies, and two Muslim Filipinos who have experience in Halal industry development. The development and promulgation of Philippine National Standards for Halal (PNS Halal) will be left to standard-setting agencies of government: DA – BAFS (Bureau of Agriculture and Fisheries Standards) for primary and post-harvest foods; DOH – FDA (Food and Drug Administration) for processed/prepackaged foods, drugs and cosmetics; and DTI – BPS (Bureau of Product Standards) for non-food products. The accreditation of Halal certification bodies will be the function of the Philippine Accreditation Bureau under the DTI. 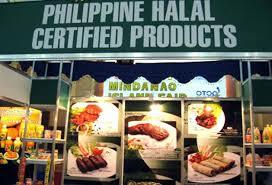 The Philippine Halal Promotion and the Development and Accreditation Board, under the NCMF, is being dissolved. The amount of P50 million is proposed to fund the Halal Board and other programs identified in the bill.